Just south of Piesport in a small side valley lies the steep, south-facing vineyards of Dhron, named for a tributary of the Mosel and virtually unknown. The long-time growers in Dhron have aged and the younger generation seems unwilling to farm the extremely steep, weathered slate slopes here. Not so with Andreas Adam, who in 2000, after completing school in Geisenheim and after a stint at Heymann-Löwenstein, resurrected his family's estate and now farms 3.8 hectares in Dhron as well as Piesport. In the Hofberg vineyard, Dhron's lone Erste Lage of gray-blue slate and iron oxide, land is a fraction of the cost of lesser sights nearby, where müller-thurgau is planted extensively on fertile ground and growers much prefer to use the highly profitable grosslage name 'Michelsberg.' Adam's plots in the Hofberg are spread along the hillside, with 2 parcels planted in the early 1950's. These wines might more resemble Saar wines rather than nearby Piesport, as they are extremely steep, high in altitude, and kept perpetually cool from the air descending from the Hunsrück Mts along the Dhron river. Andreas also has several parcels in the Goldtröpfchen, including a plot on ancient terraces called the Layschen, meaning 'small slate' for its crumbling, decomposing stones. Due to his estate's tiny size, it is virtually impossible to farm organically, though Andreas farms as close to nature as possible. Vines are trained using the single post system, traditional in the Mosel for training on steep inclines, and compost is used from his relatives' farm in the Hunsrück Mountains to fertilize the vineyards. Andreas hand sorts after harvest, utilizes indigenous yeasts and a combination of different sized stainless steel, fuder, and halbfuder casks for fermentation. There are no additions of any kind: no cultured yeast, no süssreserve. 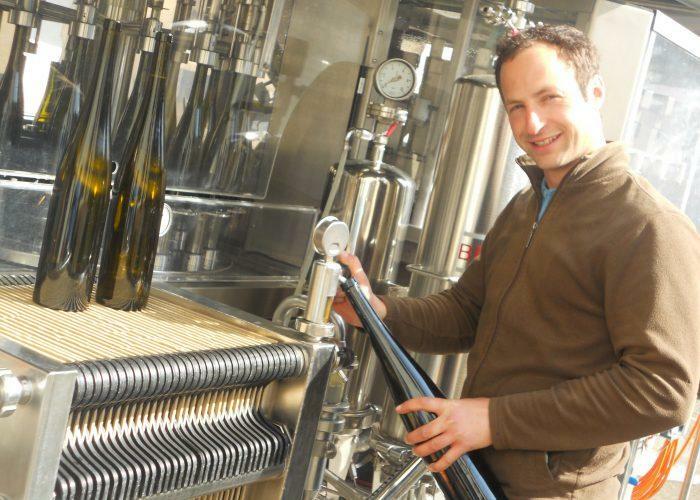 All wines are bottled under cork, and though Andreas is not a member of the VDP, he designates his Erste Lagen bottlings of Goldtröpfchen and Hofberg with a GG on the label and ferments these dry when vintages allow. His collection also includes 'village' wines: labeled Dhroner Riesling and all sourced from the Hofberg, as well as Piesporter which is sourced entirely from his red slate parcel in the Goldtröpfchen; as well, pradikät designate wines are produced . Andreas says of his philosophy: "I sustain my vineyards by intensive soil work to bring out the essential nutrients up from the primary rock, the natural compost of a vineyard. This completion of the bond between elemental soil and the work of the vintner is another piece in the puzzle of terroir... I think in Germany we see terroir as a unity of grape, climate, soil, and the mentality of the person who works the vineyard. But the essence of that mentality is a knowledge that the geology of his terrain indeed creates the flavors in the grapes which grow there." Wine Spectator 90"Good sense of [i]terroir[n]. More smoke, herb and slate aromas and flavors at first, then pineapple and grapefruit notes emerge. Firm and dense, it needs some time to come together. Best from 2005 through 2012. 75 cases made. (BS)"